Have you ever been in an Italian market and seen glorious, seemingly perfect striped pasta? No? Okay, well, welcome to the future where black and white pasta is a thing you know how to make and you understand that it’s pretty forgiving to make. 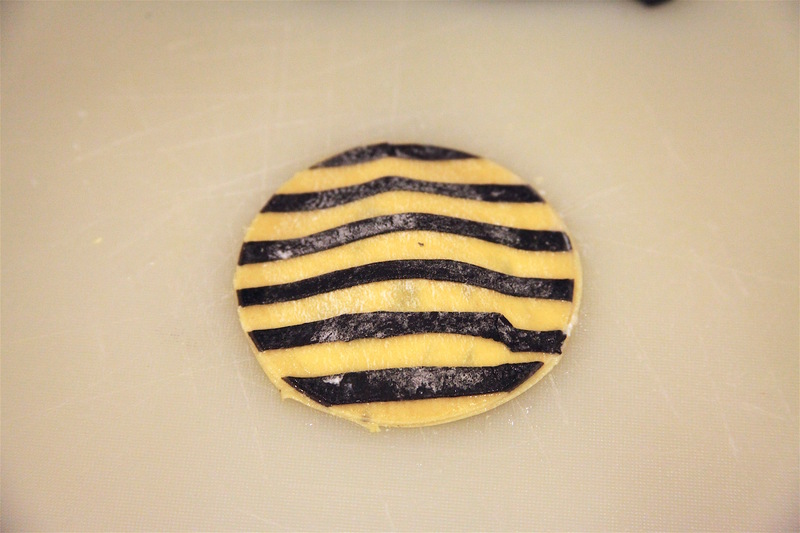 Striped pasta is often made with delicious squid ink, an ingredient we love to use here at Pâté. If you’ve never had it, it has a subtly earthy flavor. If squid ink pasta is not your style, you can simply sub it out with some food dye and get experimental with colors while you’re at it. Making multi colored pasta is pretty straight forward and allows you to get as weird as you can imagine with colors. What’s great about these black and white pasta instructions is that this process is very forgiving on the fresh pasta. In short, to make homemade striped pasta you simply make two batches of pasta, one plain and one colored. From there, you roll sheets of pasta like normal and then cut the colored sheet into fettuccine noodles. From there, you press the noodles on top and pass the combined sheet through a pasta maker. 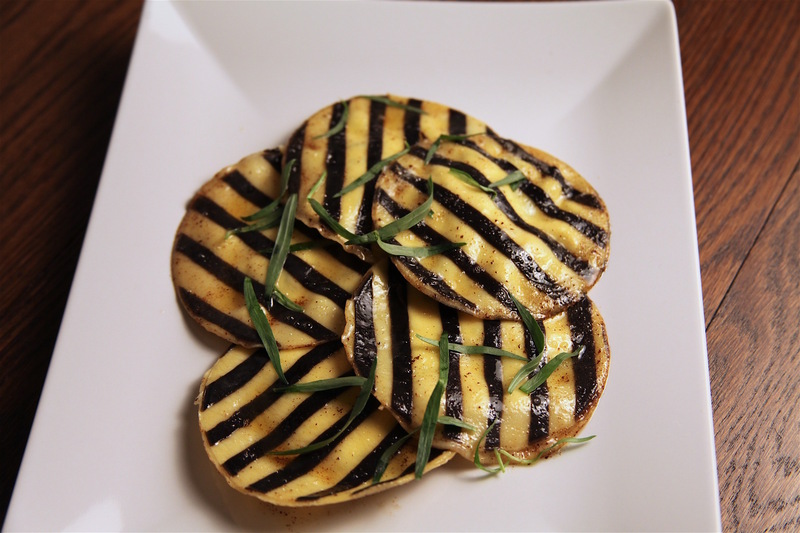 We made our homemade striped pasta into raviolis filled with an herby mint ricotta filling. We also tossed our black and white pasta in a simple brown butter sauce. Get experimental with your fillings and sauces and carbe diem, friends. Colored pasta noodles (squid ink) laid on top of the plain pasta sheets. It’s okay if they don’t look perfect at this step–as you can see mind certainly didn’t. An assembled and filled ravioli. Again, it’s okay if these don’t look 100% here! The pasta is pretty forgiving once boiled. 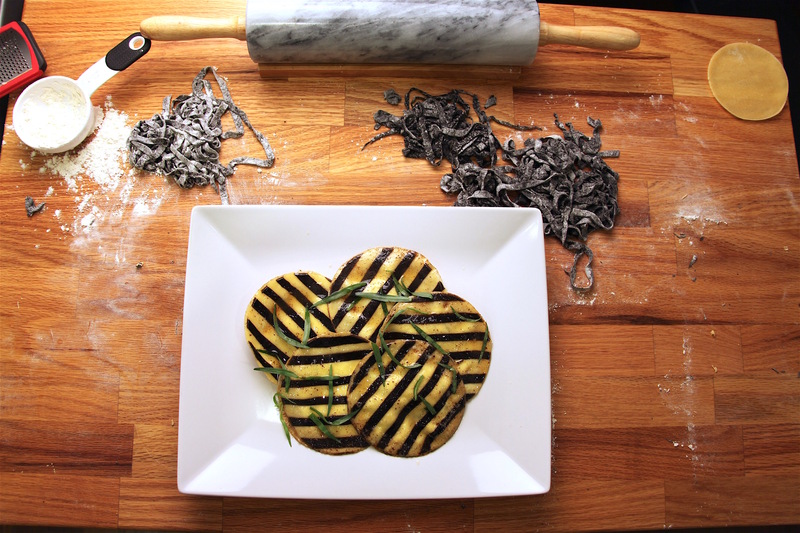 Use these easy striped pasta instructions to make a classic squid ink black and white pasta. These instructions include a brown butter mint ricotta striped pasta recipe. Make plain pasta. Make a mound of with 2 cups of flour with a well in the center. Add 4 eggs to the center and with a fork beat the eggs while slowly incorporating flour starting at the inner rim. Keep mixing until flour is fully incorporated and starts to form a mass. Knead the dough for about 3 minutes on a flour dusted surface. If too sticky, add extra flour in 1/2 cup increments. Dough is ready when it feels elastic and only a little sticky. Wrap in plastic wrap and set aside for 20 minutes. Cut dough into thirds. With a rolling pin, roll pasta out into 1/2 inch rectangle and pass through the widest setting on a pasta maker 3-5 times. Alternatively, you can roll your pasta by hand with a rolling pin. Fold dough so that the ends touch, and then fold the dough again in half where the dough edged touch. Run pasta through widest setting 3-5 times more. Pass through next widest setting 1 time. Continue until at pasta maker setting 8 or 9. Dust pasta sheet with flour and cover with plastic wrap. Repeat steps #3-6 with other thirds of plain pasta dough. Make colored pasta. In a small bowl, mix 1/4 cup of water, 4 eggs and squid ink together until color is consistent. Make a mound with 2 cups of flour with a well in the center. Add egg mixture to the center and with a fork beat the eggs while slowly incorporating flour starting at the inner rim. Keep mixing until flour is fully incorporated and starts to form a mass. Knead the colored dough for about 3 minutes on a flour dusted surface. If too sticky, add extra flour in 1/2 cup increments. Dough is ready when it feels elastic and only a little sticky. Wrap colored dough in plastic wrap and set aside for 20 minutes. Cut colored dough into thirds. With a rolling pin, roll pasta out into 1/2 inch rectangle and pass through the widest setting on a pasta maker 3-5 times. Alternatively, you can roll your pasta by hand with a rolling pin. Dust pasta sheet with flour and cover with plastic wrap. Repeat steps #10-13 with other thirds of plain pasta dough. Using wide noodle / fettucine setting on pasta maker, run colored pasta sheets through wide noodle setting to create colored noodles. Dust with flour and set aside. 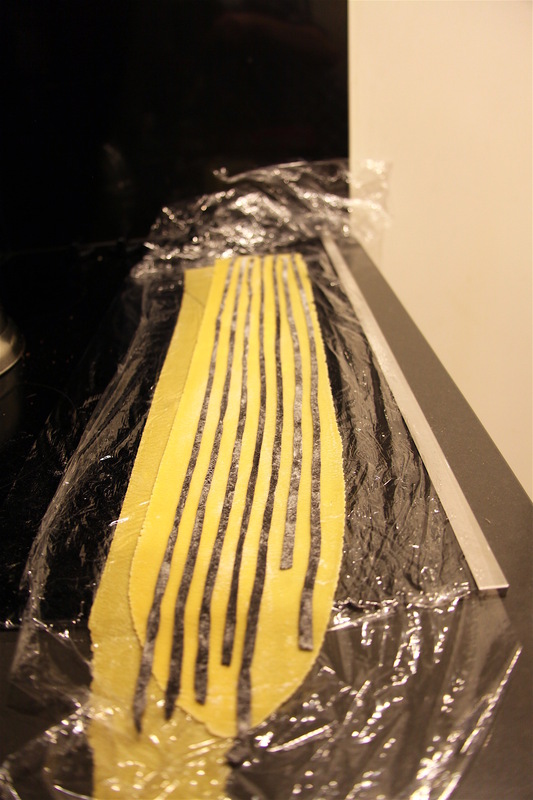 Place a sheet of plain pasta on a flour dusted counter and place colored pasta noodles on top in a stripe pattern. Gently press colored pasta noodles down with a rolling pin. (Note: don’t sweat it if it doesn’t look perfect–this pasta is forgiving when cooked). Carefully run combined pasta sheet and colored noodles through pasta maker until at desired thickness. On a floured counter, place combined pasta sheets down and with a food ring, cut out 3.5 inch circles. Set aside. Make mint ricotta filling. In a medium mixing bowl, combine ricotta, parmesan, parsley, mint, tarragon, salt and pepper. Set aside. Assemble raviolis. Take a pasta disc and spoon 1-2 tablespoons of ricotta filling in the center. Wet outside edges with water and top with another pasta disc. Gentle press edges down and repeat with all remaining pasta discs. Heat a pot of salted water over medium heat. Once boiling, add assembled raviolis. Remove once floating, or after 60-90 seconds. Make brown butter sauce. In a large skillet on low heat, melt butter. Simmer until lightly browned with a light aroma. Remove from heat and mix in lemon juice, salt, and pepper by swirling the pan. Toss the pasta in the skillet and coat with brown butter sauce. Plate and garnish with fresh tarragon. Made striped pasta at home? Tag your homemade black and white pasta photos with #PateSmith or share them in the comments for the chance to be featured onsite! Huge shoutout to @magicmolllymoll for making our homemade striped pasta recipe!